The Return of the Royal Hawaiian, Laguna Beach. Tuesday, December 6th, I stayed at my day job a little longer than usual and found my drive home on the 405 to be absolutely unmanageable. Like total gridlock. Parking lot on the freeway. So I took the first quick exit on to the 133. A highway that runs straight into Laguna Canyon from Irvine. I figured that I could take the coast up through Laguna, Corona del Mar, and Newport, right into my hometown of Costa Mesa. As I was going through Laguna, I thought, man, I haven't been to the newly opened and third version of the Royal Hawaiian. So I found myself making a u-turn on PCH and pulling up in front of the place. 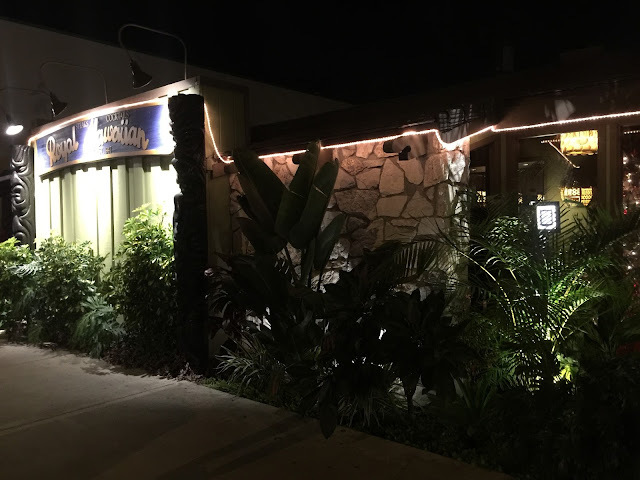 Here's my account of the newest version of the 1947-built Laguna Beach landmark. The Hula Girls played the Grand Re-Opening of the second incarnation of the Royal Hawaiian, so I was prepared to see the whole front of the place changed from when I used to go there. 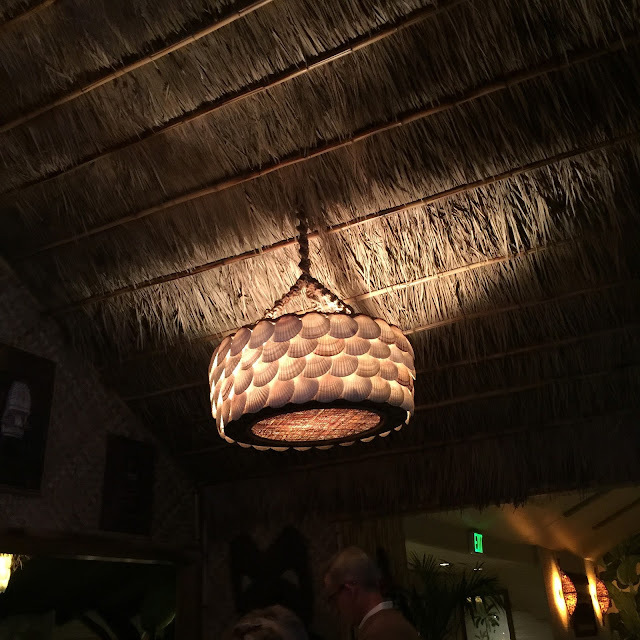 I was expecting the interior to be drastically different from the original too. The second owners had essentially turned the place into an expensive Hawaiian(ish)-themed diner. Or the Lono tiki on the door... or the Milan Guanko tiki that anchored a railing and guarded the front tropical garden. 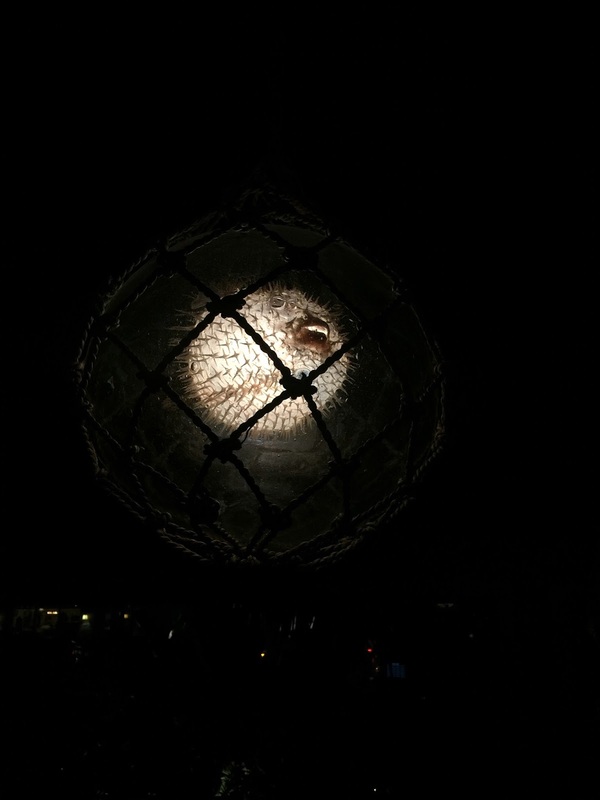 They even added some new themed outdoor lighting to the place. 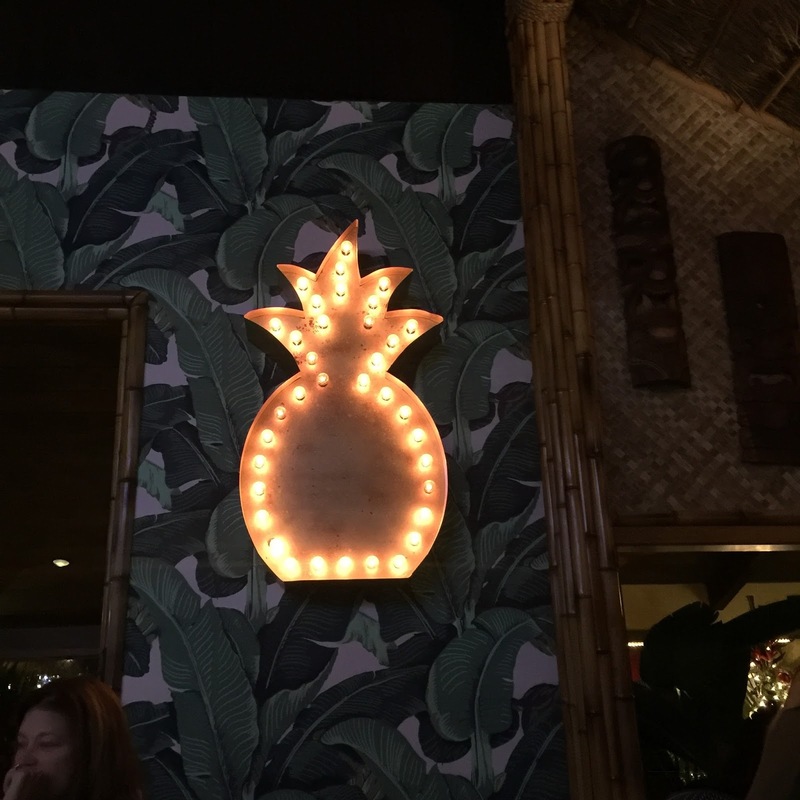 I would come to find that this pineapple theme runs throughout the whole restaurant. Everything that we, as tiki-philes, love to see in a proper tiki bar. Well, most everything... 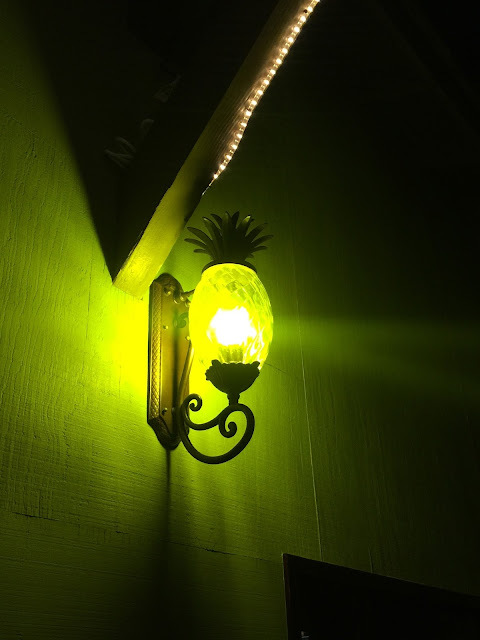 The cheap '90s fan stuck to the wall in the picture below could probably go... 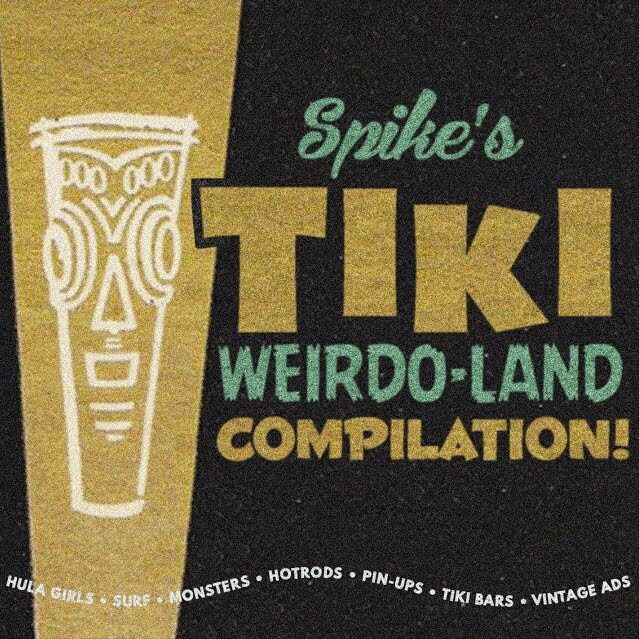 But look at that Bumatay tiki! 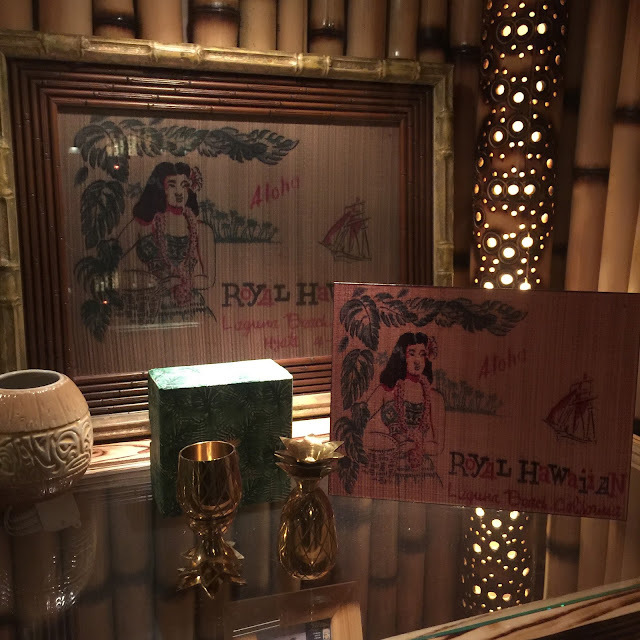 So when I came in to the current version of the Royal Hawaiian and was greeted by a glass case displaying this vintage 1947 Royal Hawaiian place-mat, I had a bit of hope for what was to come. Maybe it meant that they cared about the legacy that they had bought into. 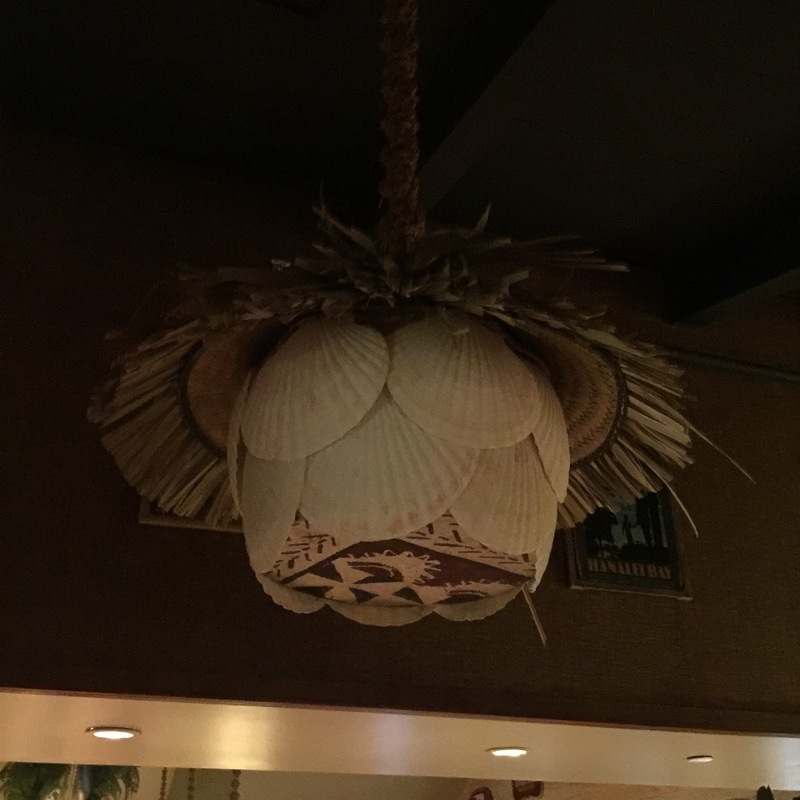 There were also a bunch of great lamps that looked like they had found their way over from our friends at Oceanic Arts in Whittier... some great traditional touches! 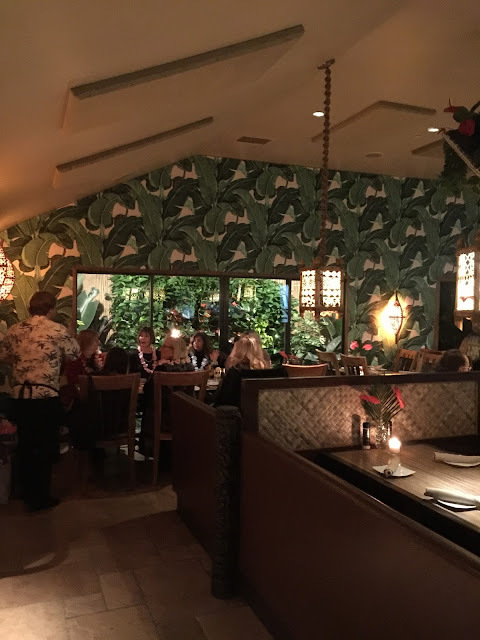 I even think their vintage palm leaf wallpaper was an interesting way to cover up some of those white walls. 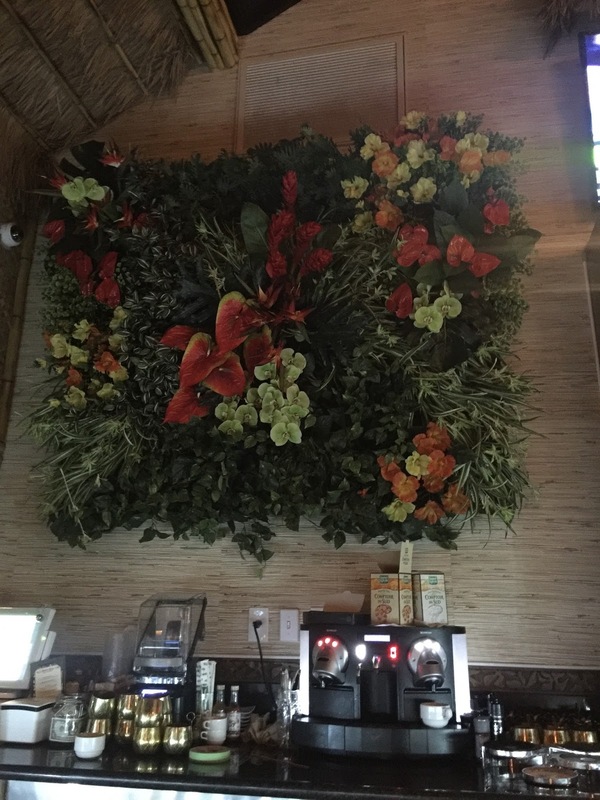 It gave the place a bit of a jungle feel... in an upscale way. 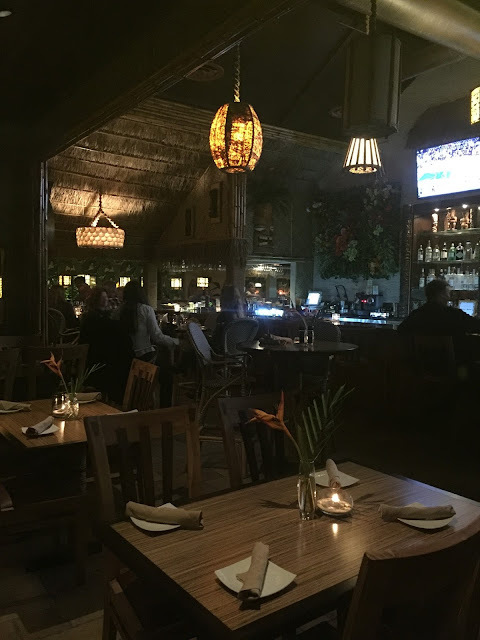 When I saw that though, it was pretty clear to me that this wasn't really going to be a 'tiki bar/ restaurant' in the way that I/ we think about them. 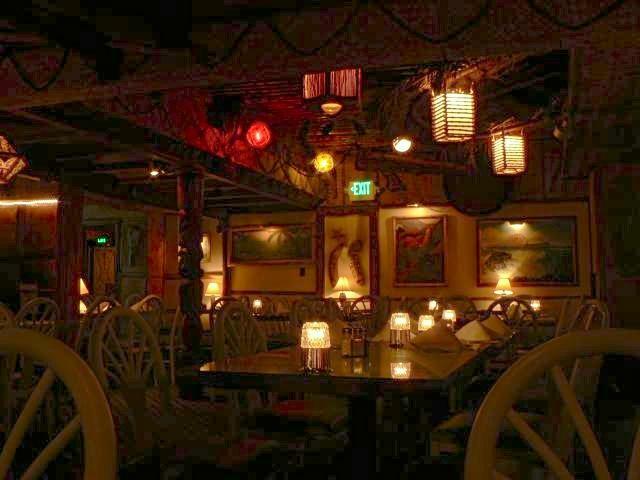 This is more of a Hawaiian bar/ restaurant. But MAN, is it an improvement from the last version! 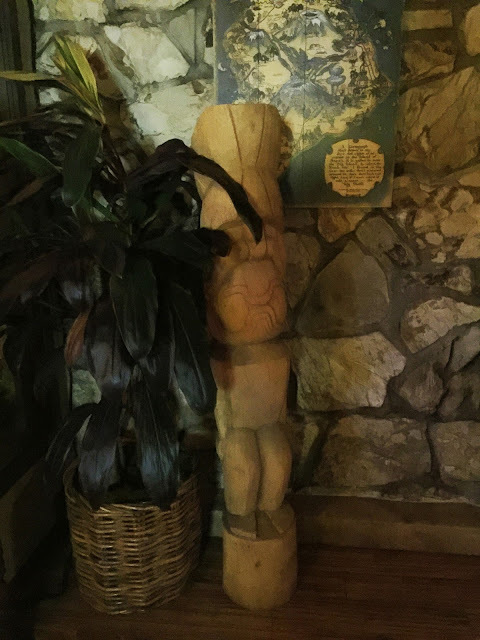 View from the bar... Bamboo Ben has recently been brought on board to help with the re-tikification of the building. After I started some big discussion on the internet about the place, I think the owners are starting to get what the place should be. 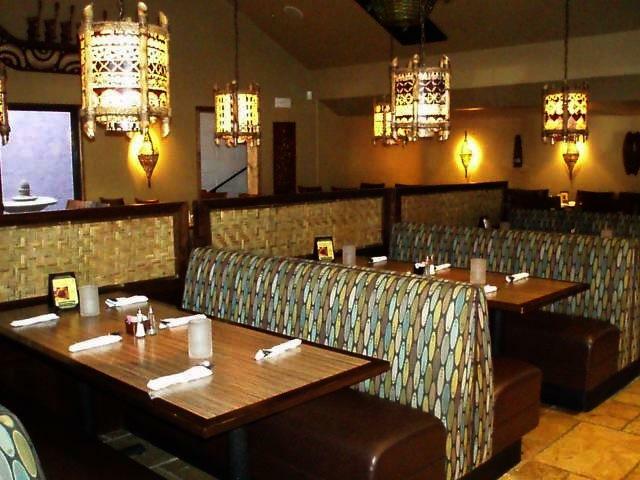 They contacted me, personally, saying that they will be adding more to get the place to look more like how it used to. Before that, the press on the place had said that their design aesthetic was going to be "woodsy industrial." Anyhow, Ben's adding of this grass matting, immensely helps with what would otherwise be a big prominent white ceiling. He also recommended the wrapping of the pillars in jute rope. Can you imagine those pillars white? They would be glaring. Look how great this room looks with the wall paper and Ben's ceiling treatment! 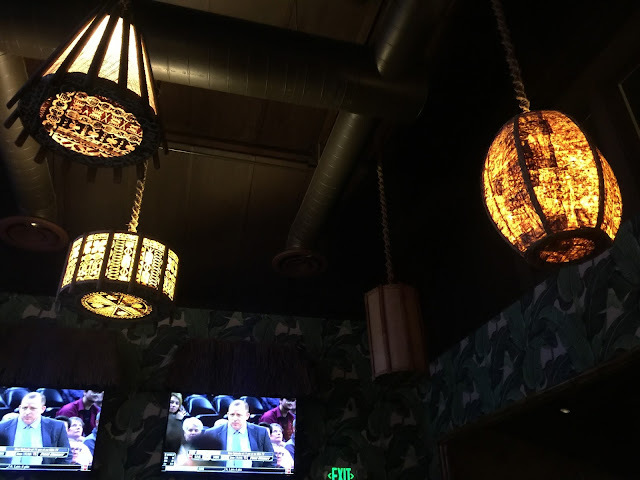 Also, the lahala matting to the right of the picture... Not 'traditional tiki', but very nice. 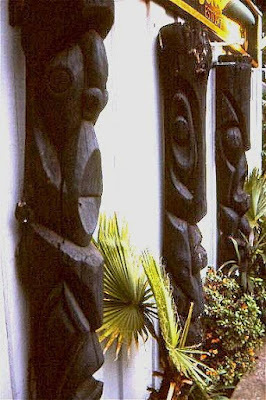 ...And most, if not all of the tikis are modern, cheaply carved tikis. 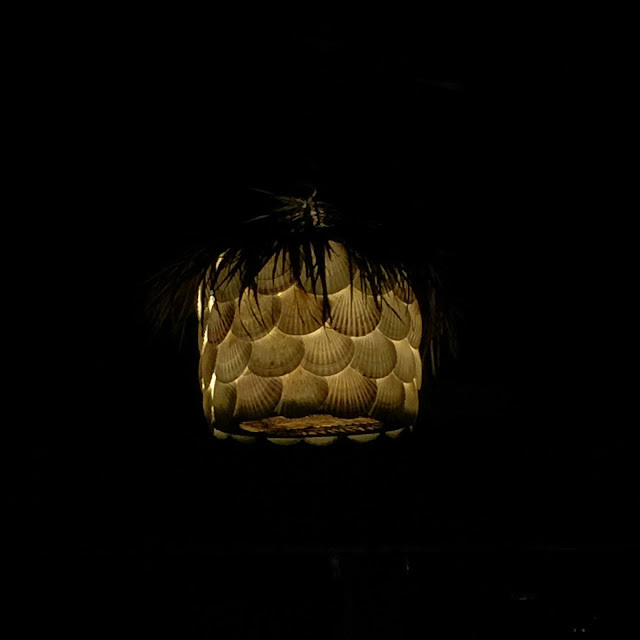 Usually from Bali. People buy them because they're really inexpensive... but they can also look inexpensive. Side note: I will, for the life of me, never understand the 'tiki smoking a cigar' thing. 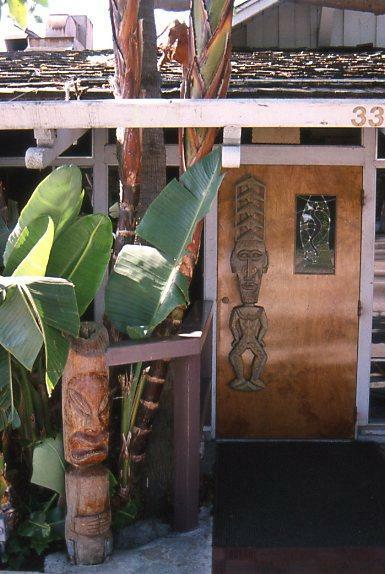 Cartoony tikis just look, well, cartoony. 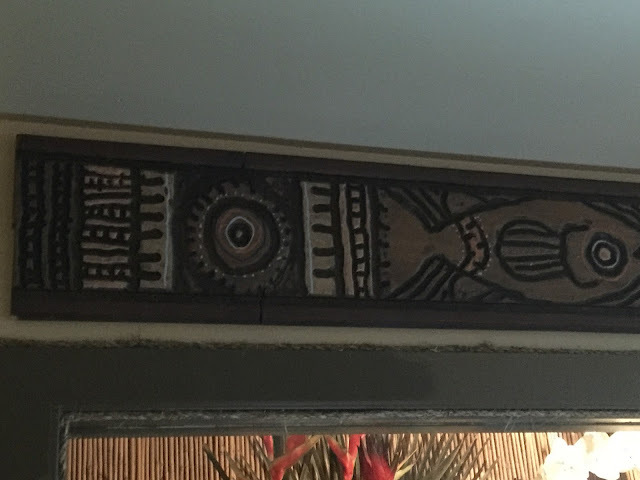 Conversely, here is another inexpensively carved modern tiki from Bali that looks pretty good. 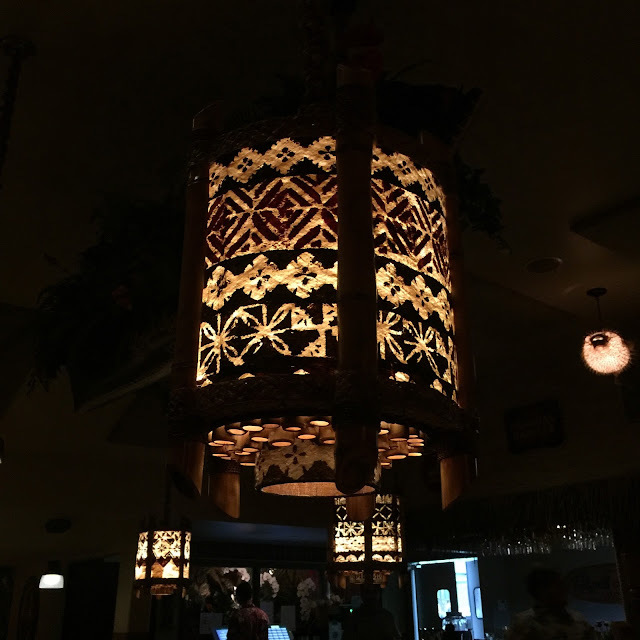 It's traditional in style. So those can look good, you just have to be discerning about them. In fact, Clifton's has two like these too... but the way that they are treated and displayed, you might never notice them there! 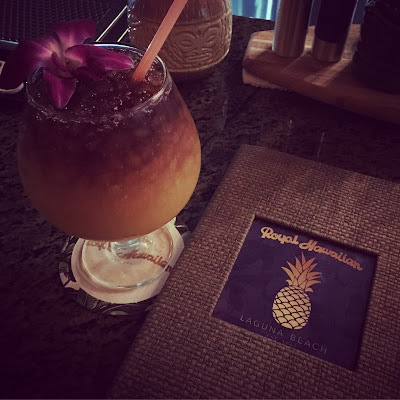 Once I settled in and ordered a Lapu Lapu, I took in the things about the new Royal Hawaiian that were really great. 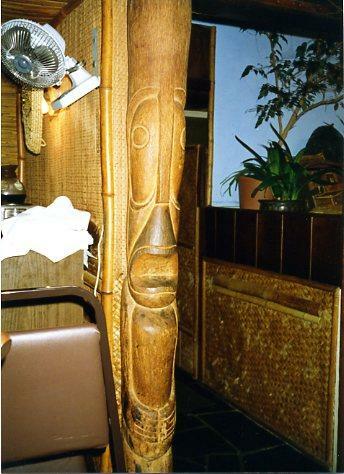 There are four of these carved Oceanic Arts poles along the back of the bar that look really nice. The new owners went to the original owners and got the recipe for the cocktail from them. So it should be the way that the original Royal Hawaiian Lapu tasted. It has been ten years since I tasted one, So I can't say for sure. 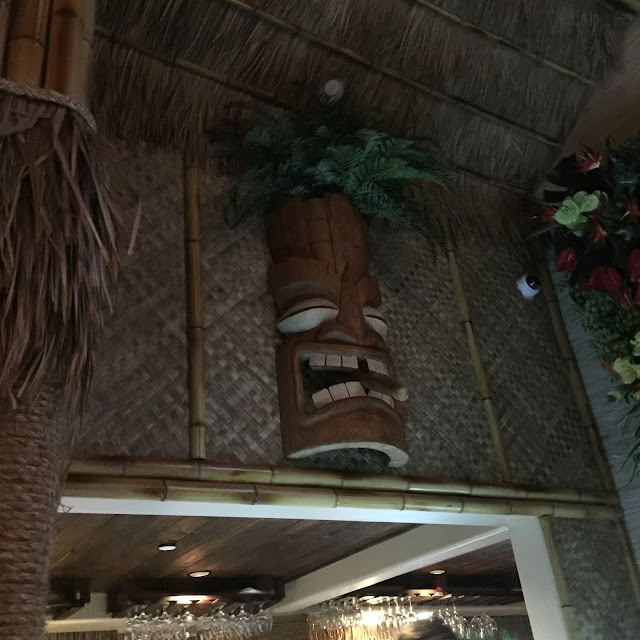 When modern fans of tiki complain about reasonably well made tiki drinks in places like Don the Beachcomber (pre-batched cocktails) or similar places, I have to laugh. 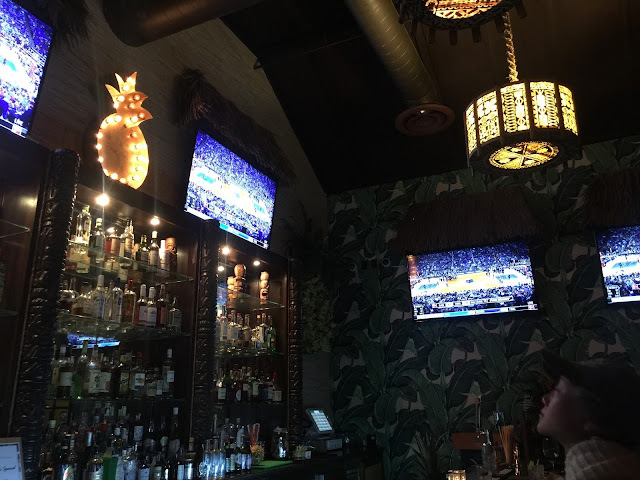 The cocktails in places that are at least trying are all WAY better than it used to be, just 10 years ago! 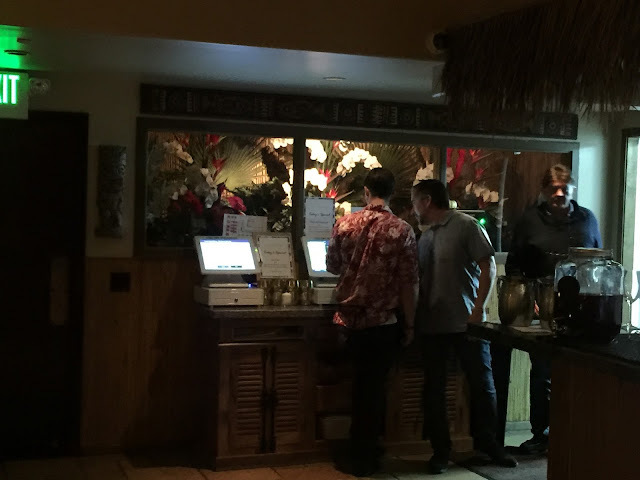 So, the Lapu Lapu is good. 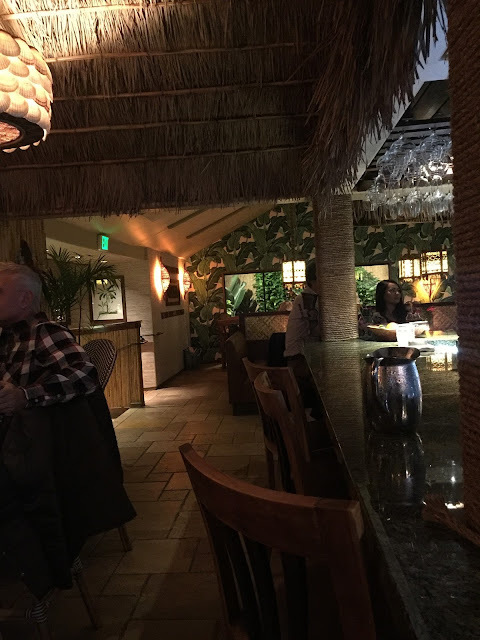 Ingredient-wise, it could be considered a Marriott mai tai (basically orange and pineapple juices mixed with passion fruit, light rum and a dark rum float) and if you go into it with that expectation, you'll enjoy it. I did. I asked the bartender if it was pre-batched or if she measured and mixed the drink herself. She said that she measured the ingredients. I should have asked how many ounces of rum was in this drink. It hit me hard... quickly. Like way too much, too fast. 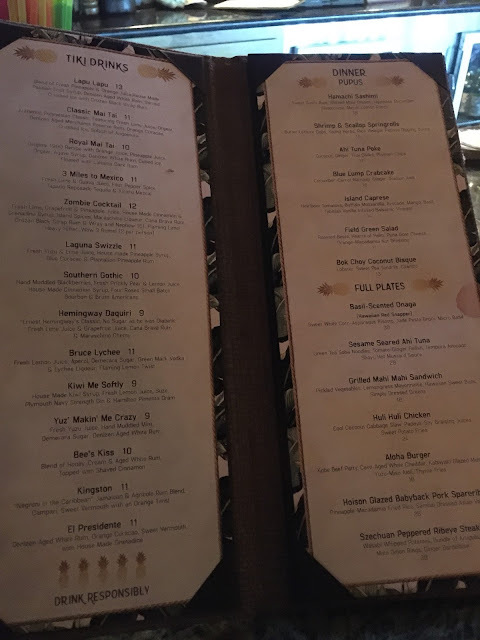 They ought to put some kind of warning on the menu for drinks with really high alcohol content, like they do at places like Forbidden Island. I felt like driving after that one drink was gonna be a risk... so I hung out and had a bunch of water. 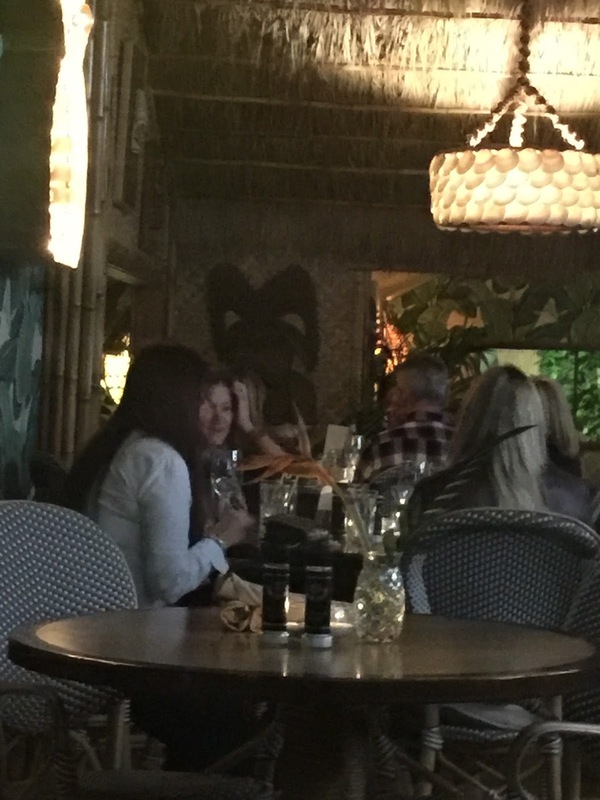 I like getting snockered as much as the next guy, but one cocktail shouldn't do that to you. 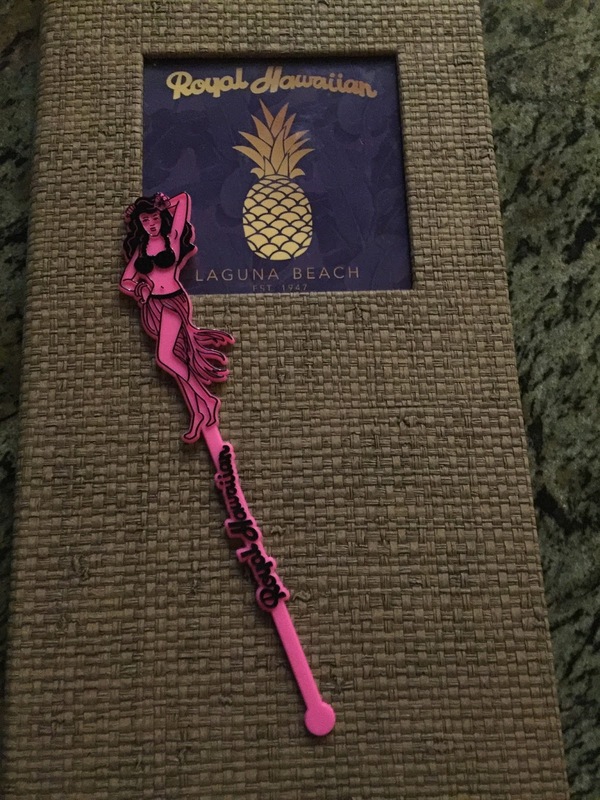 Their menu, coasters, and signature swizzle stick were all nice. As a marketing/ design professional, I do question the 'out-of-nowhere' color of the swizzle when everything else in the bar is green, but that is really kinda getting into the minutia of the place. 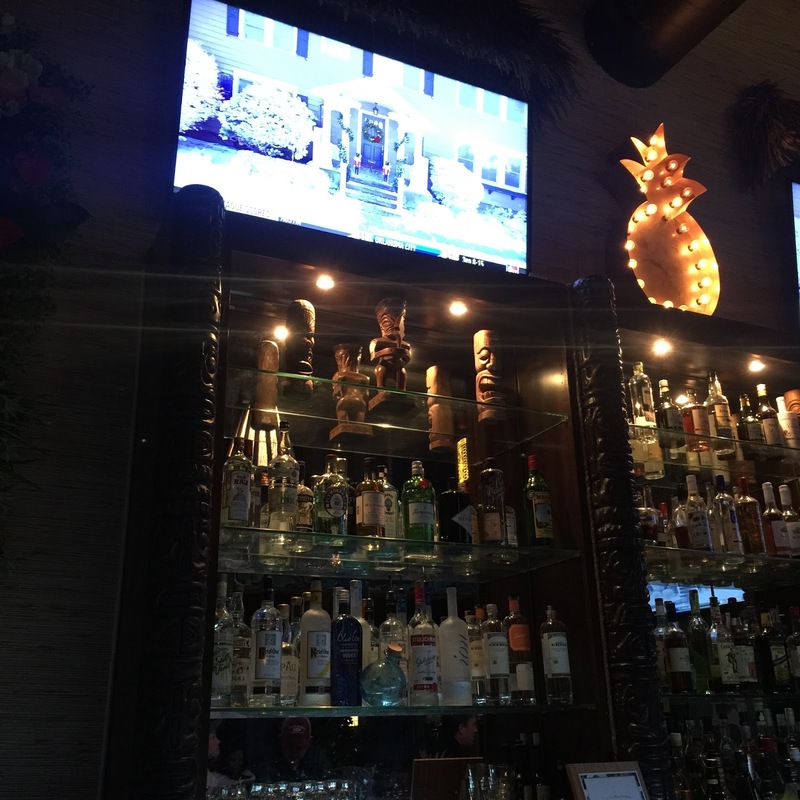 With that giant glass of rum swimming in my head, I explored the bar area. It was decidedly more 'tiki' than the rest of the building! 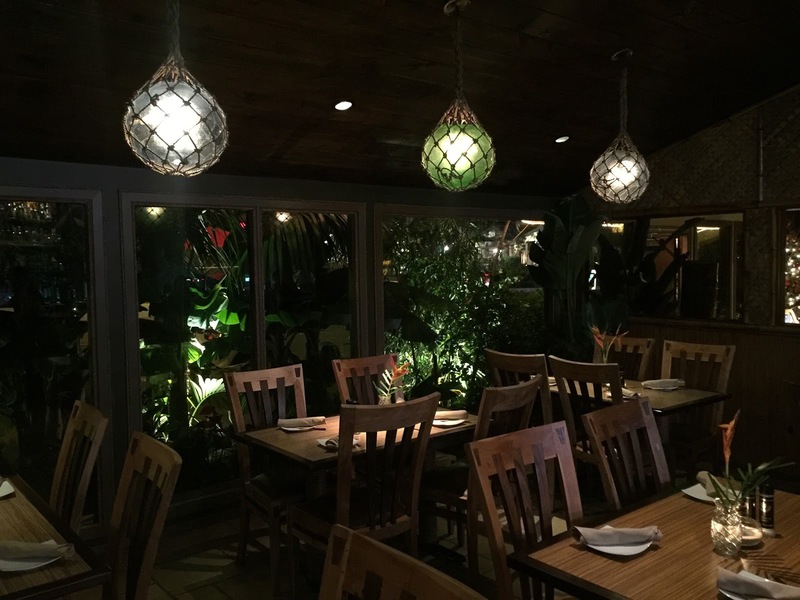 I love how the outside foliage is lighted and seems to 'come into' the dining space. What. They look cool..! I'm not critiquing, just observing. More great lights from Oceanic Arts. And actually, the flatscreen TVs are placed so high in the bar that you can ignore them pretty easily if you're looking to. Back in the dining area, you can see that the new owners are utilizing the old diorama windows, though they are really just used as tropical flower gardens now. They could go a long way with some vintage-looking tikis or other native artifacts in them. There's another great Leroy piece in the bar too! And a clearer picture, taken before they got Ben to put up all of that great thatching on the walls. I went into the Royal Hawaiian as a cynic. I'm a purist about these places. Especially in dealing with a place that I loved. When I saw it's second incarnation in the mid '00s, it was shocking, underwhelming, a bummer. This place is leaps and bounds beyond what that place was. I think that everyone should see the new Royal Hawaiian for themselves. Their intention is good. 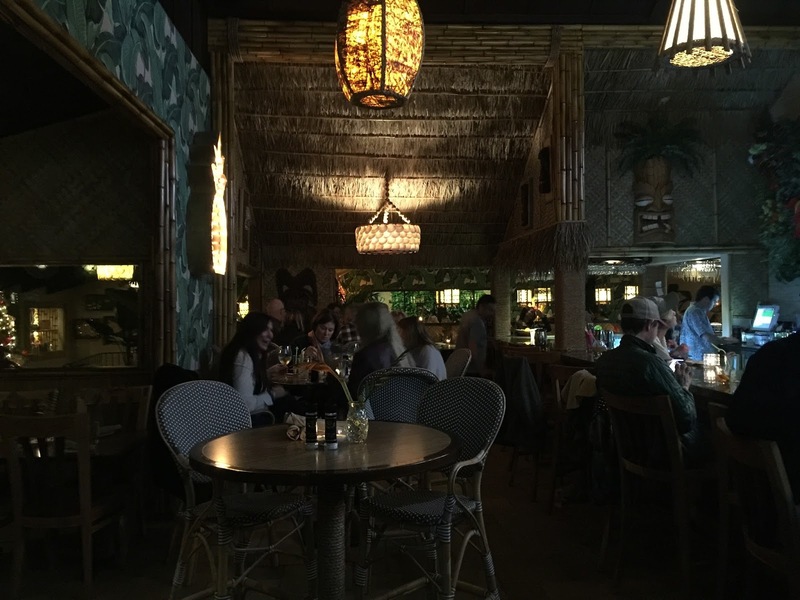 This would have been an incredible place in the early days of the tiki resurgence. Hell, I remember going to a Hawaiian-themed place in the Aladdin Hotel in Las Vegas just to see a display case with some tiki mugs in it and a lunch-time floor show. 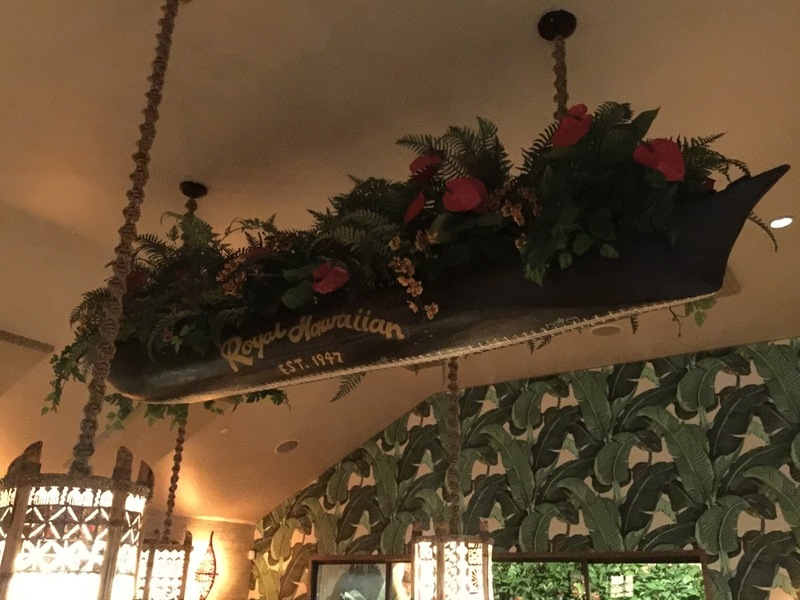 Any critique that I have of the new Royal Hawaiian is because of my memory of the original place. It's really not a fair comparison anymore. You need to judge and experience the place as it's own entity. 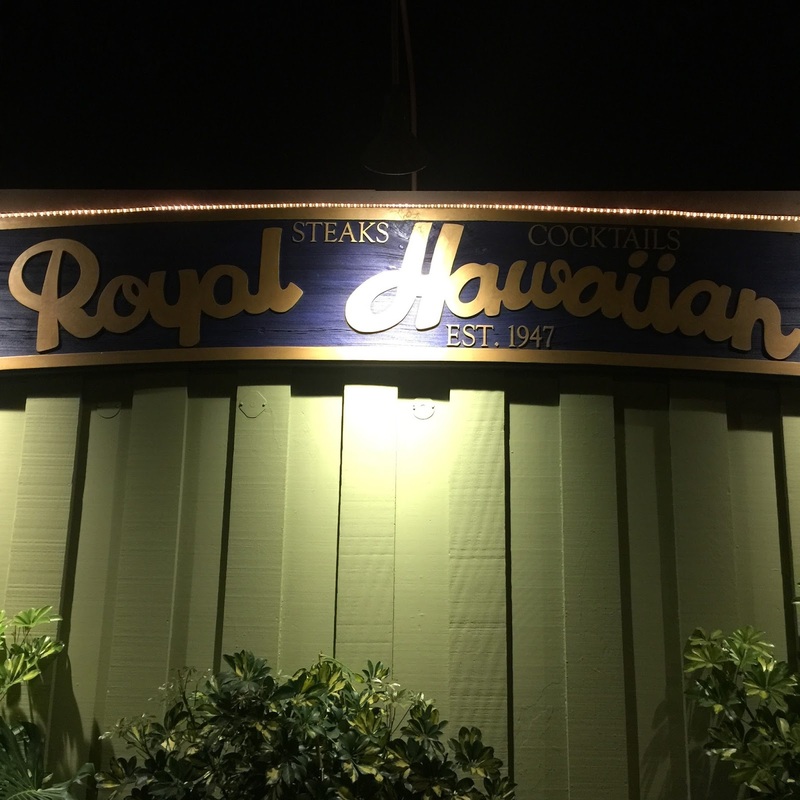 If we all critique these places right out of business, they WILL be gone forever. That's the same approach that I take with Don the Beachcomber (Sam's Seafood). 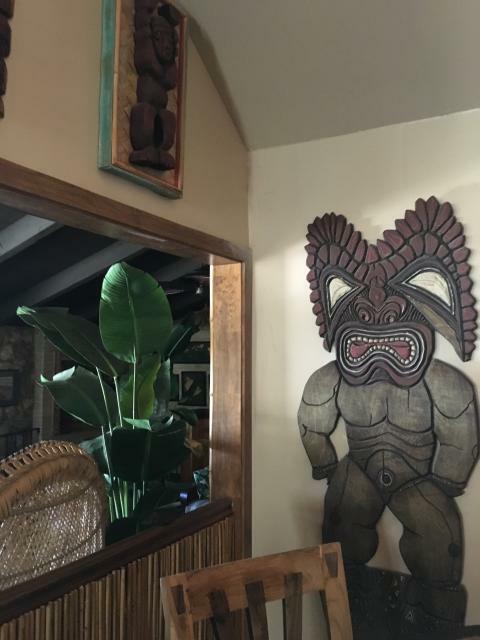 Not everything there is perfect... but it's the original building and decor from 1960. Complain about them, boycott them, whatever your issues are with them...and they WILL be gone forever. The owner came up to me in the lobby of the place while I was taking pictures and was super friendly and accommodating. He talked about eventually having theme-appropriate live music there, "not just a top-40 cover band." He referenced the legacy several times while talking to me. The staff seemed attentive and the food smelled good throughout the restaurant. 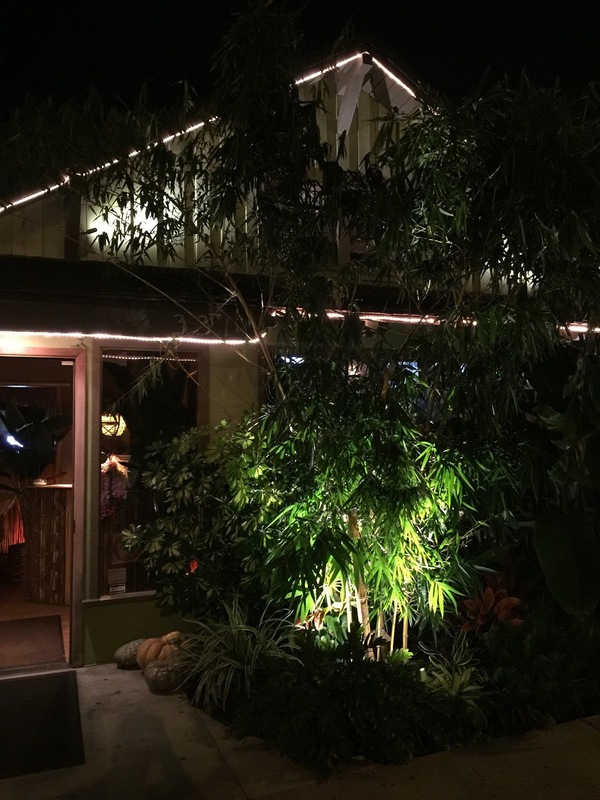 The more that they allow Bamboo Ben to add to the building, the better the place is gonna be. They're off to a good start! 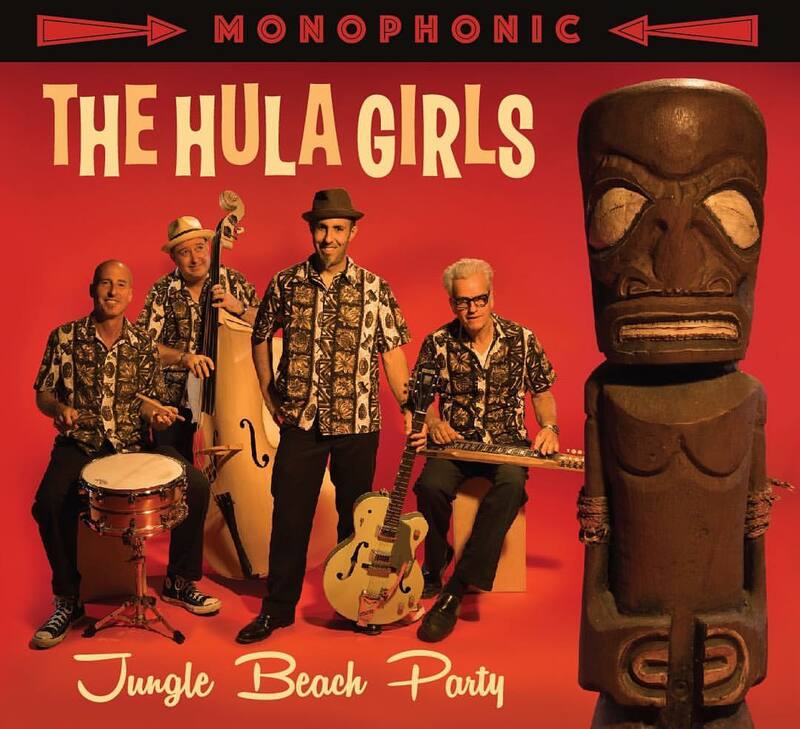 The Hula Girls play, this Saturday, at the incredible 1960-built tiki palace, Don the Beachcomber. 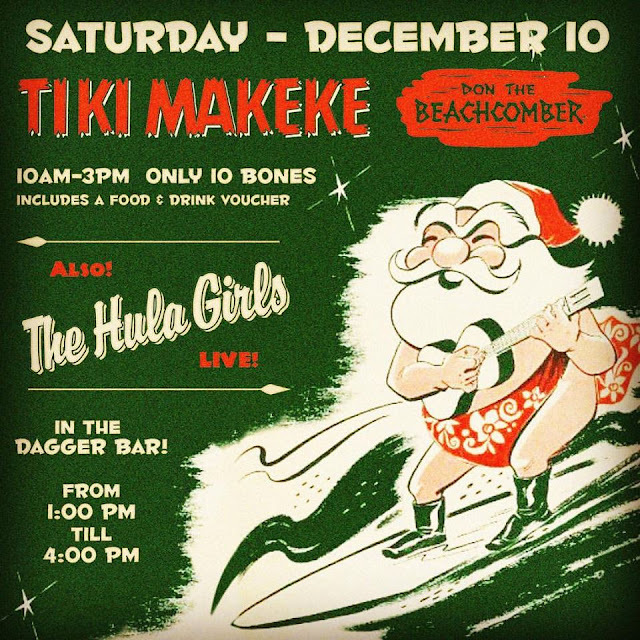 We'll be on from 1-4pm during the Tiki Makeke (Marketplace). Free show! Hope you can make the scene!